3rd annual TEDx event February 1. 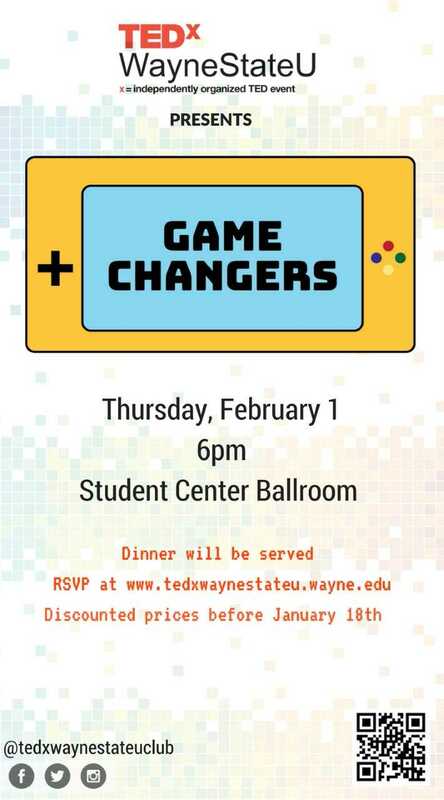 TED Talks are coming back to Wayne State. “Every idea and every speaker, whatever they are talking about, is already an idea that is…changing the game in some sort of way,” said TEDxWayneStateU President Saadia Taj. Taj, who is an Honors student, psychology major and pre-med student, wanted the topic to be broad enough to encompass their speakers’ best ideas while not confining them to a certain topic. This year speakers include three Wayne State University alumni, a PhD and undergraduate student and three Wayne State University faculty and staff members. Tonya Fitzpatrick (lawyer; travel blogger and Wayne State alumnus): She will talk on the transformative power of travel and how changing one's perspective when traveling can open up new doors and wholly transform you. Anne Duggan (Department Chair CMLCC): She will talk about how understanding the history of fairytales can give us greater insights into how we view our current world. Adrian Hatfield (Associate Professor of Art and Art History): He will talk about turning difficult and complex ideas into beautiful and understandable artwork in relation to the sublime. Garland Doyle (Political Science Ph.D.): He will talk about how he learned to read and share stories and lessons on how to face failure up front in a “success only” driven world. Mujtaba Hameed (Public Health Honors): He will talk about the importance of engaging in one's environment and community even if you are not originally from it. Detroit used as the prime example. He will also speak on the only real way to initiate change in a community is by investing in its people. Now how do we do that? In addition to the speakers, there will also be different labs that audience members can participate in during the intermission. Some of the labs include a “Speakers Last Works” station, where audience members can view prior works from the speakers, a TED-ED riddles table and a pixel-art creation workstation that uses sticky notes to create artwork. According to www.ted.com, TED is a nonprofit organization devoted to spreading ideas, usually in the forms of short, powerful talks that average 18 minutes or less. Ted began in 1984 as a conference where technology, entertainment and design converged. Today, TED Talks cover almost all topics – from science to business to global issues – in more than 100 languages. She added that it was also a great networking opportunity, especially for those in the audience who are interested in the field the speakers are in. Once the conference is over, there will be a dinner where audience members will be able to interact each other as well as with the speakers. Tickets for the TEDx event can be purchased at tedxwaynestateu.wayne.edu. Tickets are limited to the first 100 people that purchase tickets.